Tin Cans: Tin cans are made from 95% steel and only 5% tin. In order to be recycled the cans must be “detinned” using a caustic chemical solution that dissolves the tin from the steel. The steel is then sent to steel mills to be made into new products and the liquid is transferred into an electrolysis bath. When electricity is applied the tin collects on a plate where is can later be melted off and fashioned into ingots. Copper: When copper scrap is received for recycling it is visually inspected and graded, and analyzed chemically if necessary. Loose scrap is baled and stored until needed. Number 1 copper is melted directly and in some cases brought to a higher purity while molten in a process called fire refining. The molten copper is then deoxidized and cast into billets, casts or ingots for further processing. 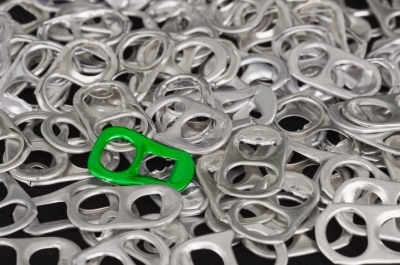 Aluminum: Beverage cans are the most-recycled consumer product in the United States. When aluminum reaches a recycling plant it is shredded and melted. The molten aluminum is gradually hardened into ingot form. These ingots can then be made into aluminum sheets or other desired forms. The metal sheets are used to make new aluminum cans and the cycle begins again. Making aluminum from recycled aluminum scrap take only 4% of the energy that it takes to make aluminum from raw bauxite ore.
Steel: Steel can easily be removed from other recyclables because it is magnetic. Once separated the steel is melted in a furnace and then poured into casters that roll the steel into sheets. Recycled steel cans may be made into new cars, girders for buildings, ships, or new food cans. Steel can also be recycled again and again. It does not lose any of its strength or quality in the recycling process. It can be a never-ending process that continues to save energy and resources. "I have scrap to sell"
Far West Recycling offers fast friendly service at three Portland Metro locations. Prices change daily and are the same at all locations. Please see the list of materials we accept. When you bring your materials in we will weigh the different materials on state certified scales. You will be paid cash for all ferrous metals and a check issued 3 days after sale for non-ferrous material. We do require state ID for all non-ferrous sales. This is in compliance with Oregon metal laws (SB 570). To ensure a smooth transaction please presort your materials before coming to Far West Recycling. The cleaner the material and better sorted the more money you will make for the material. Our scale buyers will help with questions but will not sort or clean your materials. Far West Recycling is an active participant in CICP and with local police and sheriff departments in combating metal theft. Far West Recycling will NOT buy stolen material. Far West Recycling is an industry leader in providing complete recycling solutions for businesses of all sizes. With the ability to provide everything from drop boxes to small bins at multiple locations, Far West Recycling can tailor a recycling program to help achieve your company’s goals.